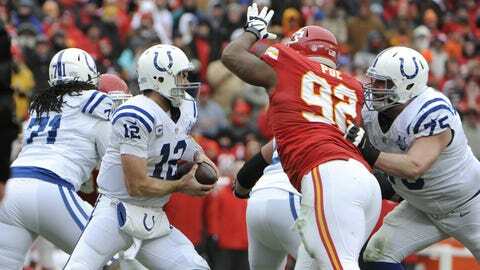 A leaner Dontari Poe has emerged as one of the league's best nose tackles. KANSAS CITY, Mo. — Frank Schloegel knows smoke. And as far as he’s concerned, Dontari Poe was just blowing it. 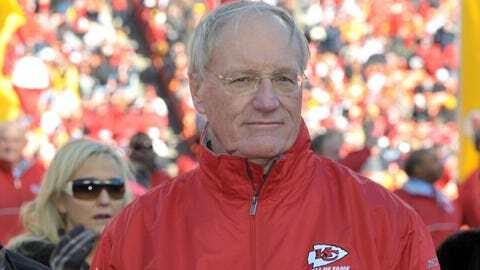 "Well, you know, the thing is, if you pay attention to what everybody says," Schloegel, one of the proprietors of Woodyard Bar-B-Que, a staple of Kansas City, Kan., says of Poe, the nose tackle who’s become a staple of the Kansas City Chiefs’ defense, "there’s always somebody picking on something." Over the summer, Poe went all sacrilegious on Frank and thousands like him on the home front, declaring that he’d lost weight by cutting out barbecue, that Kansas City cornerstone. Then he went out and played like a holy hand grenade, emerging as one of the best nose tackles in the NFL and garnering a Pro Bowl berth in the process. All of which, you see, puts Frank in a bit of a pickle, fried or otherwise. As a BBQ man and a Chiefs lifer, he’s torn between his love for Poe’s Sunday bulldozer act at Arrowhead Stadium and his disappointment with losing a 346-pound customer. "It’s one of those things — I suppose you could make a deal out of it that’s negative," Schloegel says. "We just kind of let it go." Easier said than done, that. Frank is among the fourth generation of Schloegels to smoke in greater Kansas City; that unmistakable hickory smell practically seeps from the family pores. Woodyard’s famous burnt-end chili was featured in the book "500 Things to Eat Before It’s Too Late" and was selected the Best in the City by The Pitch weekly magazine in 2011; their ribs took home The Pitch’s Best of the City honors in 2013. All this, and no Poe. "You can lose weight hating your neighbor," Frank says, chuckling. "Pick and choose whatever makes you feel good." And Dontari? Dontari feels great. The tired legs and short breaths of a rookie season in which he played closer to 350-355-ish are a thing of the past. "Yeah, I feel better," says Poe, who’ll lead a Chiefs (11-5) defense into Indianapolis (11-5) for the first AFC wild-card matchup of the weekend. "Usually, when you drop weight, you feel better." Fresher, too. In an age of situational linemen and pass-rush packages, Poe is the axis around which defensive coordinator Bob Sutton rotates his myriad of looks and personnel groupings. The big Memphis native appeared on 581 pass-rush snaps, 352 run snaps and 1,004 total snaps, according to the number-crunchers at ProFootballFocus.com (PFF), all of them tops in the NFL among defensive tackles. Poe’s total snaps were 19 more than No. 2, Tampa Bay’s Gerald McCoy (985), despite the fact that the former didn’t play a lick in Week 17. "But at the same time, I’m just playing when I need to play," says Poe, who was credited with 50 stops during the regular season, 42 of them solo. "It’s not too different; when they need me to play, I play. That’s all it is, really." They’ll need him Saturday, start to finish. Poe proved a consistent, if unspectacular, cog the last time these two teams met, back on Dec. 22 at Arrowhead Stadium. PFF graded him as a +1.6, with a +1.4 on his run defense and a +0.9 on pass rushes. That capped a season — his second — in which the site ranked him 10th overall (+23.5 cumulative) among starting defensive tackles and sixth overall (+15.0) in terms of run defense. "Dontari Poe is a very unusual, physical person," defensive line coach Tommy Brasher says. "He is a big, powerful man who has quickness and is very smart. (He) has a great feel for the game. I think he has a great future." At the moment, though, he’s more concerned about Poe’s present. He’ll be playing in his first playoff game at Lucas Oil Stadium, his first taste of a new level of speed, a new level of intensity — and a whole new set of stakes. "Yeah, we’ve been talking about it now for a couple of weeks, like what it’s going to be like and just sharing about the speed of the game and how everything ramps up," says Chiefs defensive lineman Mike DeVito, who’s done this dance before as a member of the New York Jets. "But you guys know Poe — he’s not really a slow guy, so I don’t think he’ll have any issue." In fact, PFF charted Poe as 10th among starting tackles in pass-rush pressures (28) and said he was responsible for a run "stop" on 8.5 percent of his run snaps — that ranked 11th among first-team NFL defensive tackles, in the same neighborhood as ballyhooed peers such as Detroit’s Ndamukong Suh (8.6 percent), Baltimore’s Haloti Ngata (8.4) and Seattle’s Brandon Mebane (8.3). PFF says Poe played on a possible 94.1 percent of all possible defensive snaps this fall; that’s up from 74.4 percent — a jump of nearly 20 points — from his rookie year. Cut out the pork, bring serious beef. Simple, right? "Simple, yeah," Poe says. "Start small." "(Poe) certainly compares favorably with the best I’ve ever coached at this point in his career," says Brasher, whose list of ex-pupils includes Hall of Famers Cortez Kennedy and Reggie White. Hell, even Frank has come around. "Oh, yeah, we forgive him," Schloegel says, laughing. "We feel kinda sorry for him." Sorry? The dude just punched a first-class ticket to Hawaii. "Hawaii?" Frank says, and laughs again. "No ribs over there."